Scully Company is thrilled to be among the winners of the 2017 Best Places to Work in the Greater Philadelphia Region. 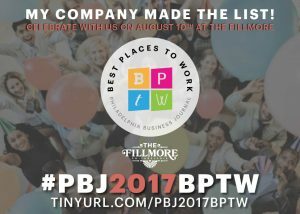 Each year, the Philadelphia Business Journal and Quantum Workplace search for the top companies to work for in the Philadelphia region. Based on our company size and our employee surveys we have hit this notable benchmark. We look forward to celebrating at the Breakfast Celebration/Award Program on August 10, 2017 at The Fillmore, Philadelphia.